This article has moved to this location. In my previous article, i’ve shown you how to generate pdf using DomPDF library. In this article, i’ll show you how to generate pdf in symfony using mPDF library. mPDF has the same concept with DomPDF, generate pdf from the html content. Nested block-level elements (e.g. P, DIV) are supported, with enhanced CSS support e.g. margins, borders, padding, line-height, background colours etc. CSS style attributes now fully support font, font-size, color, and background color (for highlighting) plus many more. 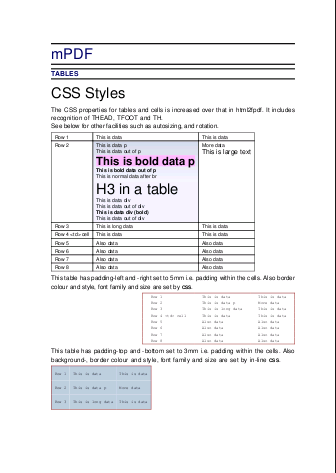 Table cell padding and borders are supported. List indenting can be defined. Ok.. first, download mPDF library, extract and put in the lib folder. 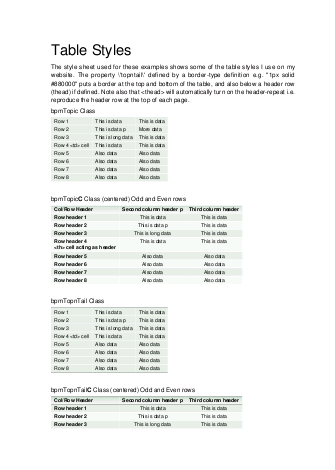 In this article, i’ll take example05_tables.php as an example. You can find more examples in the mPDF examples folder. Yeah I know is depecrated but that seems not to be the problem. As I said it works well on production environment. On development I get those nasty header already sent error and the message that the PDF cannot be sent. However I tried another library and it works fine. I used TCPDF trough sfTCPDFPlugin. It seems a little bit heavier (it takes 2 or 3 seconds to display the PDF) but works like a charm on both dev and prod environments and it seems less prone to error. I hope all this info may help others. 1. At the end of the executeAsPdf function I had to add “return sfView::NONE;” to suppress error messages. Hey there! excelent (and smooth 🙂 ) use of mPDF! im using it right now… its just perfect! Thank a lot and greetings from Venezuela!! !